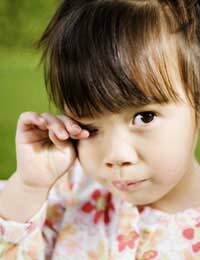 If your child has pink sore or itchy eyes, it’s possible that conjunctivitis is to blame. But before jumping to any conclusions, it’s best to see your doctor. Allergy is only one of several causes of childhood conjunctivitis, and each different kind of conjunctivitis has different treatments, so it’s important to confirm that your child’s sore eyes are down to an allergy. If that turns out to be the case, here’s what you need to know about it. Allergic conjunctivitis is an inflammation of the conjunctiva, which is the thin membrane over the white part of the eye and the insides of the eyelids. This inflammation is a symptom of an allergic reaction. Your child might be allergic to a variety of different things, but it’s quite likely that the cause will be hay fever. Allergic conjunctivitis usually affects both eyes at the same time. If your child is diagnosed with this condition, try not to worry. It’s a very common problem and plenty of children deal with it on a daily basis, especially during summer and the hay fever season. It’s annoying, it’s uncomfortable and it’s irritating, but it’s not usually dangerous or damaging. Of course, it’s always best to talk to your doctor about this. He or she will usually diagnose allergic conjunctivitis on the basis of an eye examination, though sometimes a swab might be taken. Your family doctor will more than likely deal with the problem directly, although your child might get referred to an eye specialist if that proves necessary. Sore, red eyes and a watery discharge are the key symptoms to look out for. Allergic conjunctivitis can look a bit like a cold, and if your child has a runny nose too, the combination is known as allergic rhinoconjunctivitis. Itchy eyes, blurred vision, swollen eyelids and increased tear production are also indications of allergic conjunctivitis. As with all allergies, the symptoms are caused by a sudden release of histamine in the body. This is an immune system response to what it perceives as an attacking substance. Can Allergic Conjunctivitis be Avoided? Avoiding the allergen will mean your child avoids the unpleasant symptoms of an allergic reaction. So, taking sensible precautions during hay fever season is likely to help. If your child’s trigger is not hay fever, work with your doctor to find out what the allergen is likely to be and figure out an avoidance action plan. The symptoms of conjunctivitis will probably disappear once you get rid of the allergen, but your doctor might prescribe antihistamines in the form of drops or tablets. It’s also good to try to stop your child touching or rubbing their eyes and remember to wash your own hands before applying any drops or ointment to your child’s eyes. Whenever a child experiences any problems with their eyes, it’s essential that you seek expert, medical advice. But, if a doctor confirms that your child has allergic conjunctivitis, then avoidance of allergens is the best tactic for keeping it at bay. Whether it’s pollen, dust mites, or anything else, there are plenty of practical ways that you can keep your child away from the trigger substance. And remember, it might look and feel unpleasant, but allergic conjunctivitis is unlikely to do lasting damage and can usually be controlled and managed. @mans. This is not unheard of and there are lots of possibilities including an allergy to something that you/the medical staff have not yet beenable to pinpoint. It's really something that the hospital staff and your GP need to advise you on however. Do let us know if you discover the cause.